Aside from some renovations and upgrades to the fleet during drydock, the most important change for the typical HAL passenger is the new partnership with BBC Earth. The award-winning media company will provide a series of experiences and entertainment based on their fun and informative content for Holland America passengers. From film to concerts and even events for kids. It seems like a perfect meeting of two brands and will make for many memorable cruises. Less obvious to the passengers but still a positive move are their technology partnerships with Utrip and AFAR. Utrip will provide better and more personalized booking experiences for activities. AFAR will add hundreds of references on HAL's various destinations. Both should help cruisers better plan their next vacation. 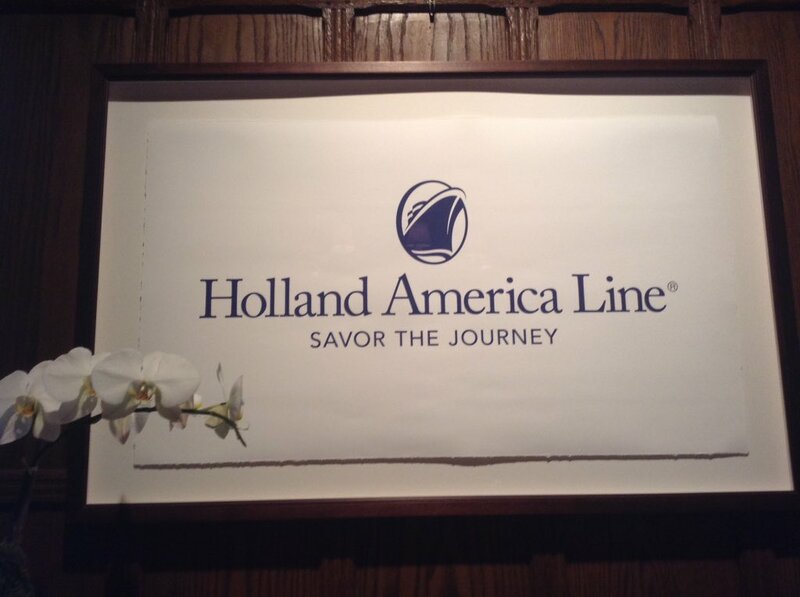 The one announcement that disappointed us was the unveiling of the new Holland America logo (below). At first glance it is not noticeably different, but upon closer inspection the old clipper ship is gone. We always loved the old logo as it represented the history of the company and the modern luxury of its current offering. What does the new logo represent? Just another generic ship. Will the average cruise passenger care? Probably not. But nuts like us do. Peter Gonzalez is back in the latest Behind the Scenes: Carnival Vista video. This time Peter's joined by Carnival CEO Christine Duffy. Together they explore the ship's new dining options and talk guilty pleasures of the ship's cuisine. Adding Duffy is a nice touch. So is focusing on food. Unlike previous episodes that focused on the technology that most cruisers don't appreciate or an on-board experience that not all will try, dining is an essential part of any cruise vacation. Seeing the new locations and learning about the potential menus, sells the idea of what the Vista will be. With its christening nearing, excitement for the Norwegian Escape is building. The fifth largest cruise ship every built will have all the latest in ship amenities. USA Today's Cruise Log has an exclusive look at the ship and a run down of all its unique features (like snow in a spa). The ship will sail year round from Miami and carry over 4,200 passengers. We may not have flying cars, but we have tweeting ship. @CarnivalVista, you are our future. The good news for Royal Caribbean is that no one was hurt due to the engine fire on their Splendour of the Seas Thursday. One passenger and and 19 crew members were treated for smoke inhalation, but all are fine. The bad news for the cruise company was that one of the United States' most well-known consumer reporters was onboard. Clark Howard, who has an extensive background in travel, provided updates to his audience throughout the event, including the ship drifting for two hours after the fire. Because of the delay the ship will skip Argostoli and go straight to Venice. This is yet another engine fire on a cruise ship with another safe outcome. Hopefully the industry can start identifying the sudden uptick in fires and put in prevention measures. Think you've thought of everything for your cruise? Think you've read everything about cruise planning? Well if there is anything you've overlooked, Cruise Compete has you covered. They just released their 2016 Family-Friendly Cruise Travel Planner and it covers all aspects of cruise. The document is free and 133 pages, so it has a e-book feel. The format is PDF and the chapters are straight forward and written in a helpful way. Because it is a PDF and not a true e-book, the formatting and fonts are not as reader friendly. But as a whole the document is a great reference and the right price (free). Thanks to Cruise Compete for putting it out. The U.S. Coast Guard doesn't get enough credit for all they do for the cruise industry. Look at the video above. It shows a Coast Guard team heart attack victim getting lifted off the Grand Princess and taken to a hospital on the mainland. The Coasties make it look easy, but this involves using a helicopter 80+ miles off shore in the early morning hours. According to reports the woman successfully reach the hospital. She and Princess are lucky they were so close to the California Coast and the rescue team. Like Carnival, Norwegian Cruise Line is using YouTube to introduce their newest ship. In this episode of Norwegian Escape: Behind the Scenes with Andy Stuart, Andy tours the Supper Club. The entertainment spot will have a variety of shows including a music review inspired by John Hughes' '80s teen movies. To watch other Norwegian Escape videos, go to NCL's YouTube Channel. Photos cannot convey the size of this ocean liner. Can you spot the people standing by the bow? As you've probably seen from our Instagram pictures, some ships are already decked out for Halloween. Travel Pulse rounded up a list of what each cruise line is offering during this popular and fun holiday. While most activities target kids, there are still plenty of things for adults: scary movies, costume contests, etc. Because Halloween falls on a Saturday this year, many ships will be in disembarking-embarking mode. That sort of turnaround might prevent guests from getting the full experience, but check out your cruise company and its itinerary. Many of the spooky events might take place in the days before and after the holiday. No cruise company has yet to develop an effective online booking and marketing platform for consumers. For now, they need travel agents to act as their de facto North American marketing and booking force. We disagree slightly with their belief. The cruise industry's slow shift to self-booking is more of a demographic issue than technology. While no cruise line or cruise seller has a great online experience (compared to other online and travel retailers), all the major companies and sites have perfectly effective self-booking paths. The huge portion of cruise bookings going through travel agents is due to who is booking those trips and what they want. Even with good marketing, cruises still cater to an older demographic. The older you are, the less likely you are to embrace the newest apps, newest booking methods, etc. Also it is harder to change habits. Calling your agent is that easy. Plus good agents still have faster comparison shopping, often have access to the harder to find deals and can guide you through the a la carte choices needed beyond room, dates and price. By comparison buying an airline ticket or hotel room is much simpler. The various pricing options are less opaque. Paying extra for a window or aisle, or suite in a hotel, is easier to comprehend than the various cruise categories on a the larger ships. Until cruise packages are made simpler, there is value in third party assistance. Eventually cruise booking will shift. The users will demand it and the margins will lead the cruise companies away from agents. But until people demand a better alternative, agents will be selling cruises for a long time. As we've written before, we enjoy all sorts of cruise video reviews. The Sea Cruisers (two sisters) are certainly different and it is refreshing. Take a look at their video above for the Regal Princess. How many reviewers would start off their review with a nervous walk on the SeaWalk? It doesn't end there. You get all aspects of the cruise and the ladies do a good job giving you a feel for the ship and its offerings. Check out more of their videos on their YouTube page. Some might want to avoid cruises during the late summer, early fall because of Hurricane Season. Weather patterns and change in ocean temperatures send big storms towards the Atlantic Coast, Gulf of Mexico, and Caribbean annually. But according to Cruise Fever you should embrace cruising during this time of year. They point out that when you are on a ship, you can avoid dangerous weather. While ships are able to move out of the way, sailing during hurricane season does require some preparation and planning from passengers. Because weather can impact flights and even ship departures, you should arrive in your departure port early. Cruise Fever also makes the point to get travel insurance. Most plans cover weather issues that might impact your vacation. Is Carnival the most trusted cruise line? A Reader's Digest poll named Carnival Cruise Line "America’s Most Trusted Cruise Line." The poll asked 4,500 readers which products and companies they trusted in 40 different categories. Carnival is obviously proud of the acknowledgement and some in the cruise media space are calling it a turnaround. But even if perception has improved for the company there is still work to be done. Just last month a fire on the Carnival Liberty stranded thousands of passengers in St. Thomas. A few weeks later smoke broke out on the Carnival Pride. Fortunately in both instances passengers were safe, but I am sure the passengers forced off the Liberty aren't totally trusting Carnival right now. Because they were contained and the passengers were dealt with, nothing reached the level of news coverage that the Carnival Splendor fire did in 2010. That was what did the most to damage passenger "trust." Five years later, with the Splendor somewhat forgotten, when Reader's Digest asks people about cruise companies, they naturally say Carnival. It is the most well-known brand. But even with the award we hope that the company remains diligent and keeps passenger and ship safety as its focus. Once again a major cruise company announced a plan to raise their fees. Starting in 2016, Princess will charge a gratuity fee of $12.95 per person, per day. Passengers staying in a suite will be charged $13.50. As with their current policy, Princess will allow passengers to remove or lower their fee while on board. Raising fees and essentially mandating certain tip rates, is ultimately a bait and switch. The cruise lines want to keep preaching value, yet keep adding these backend costs that are not reflected in the sale price. Fortunately there is growing movement on the upscale lines to remove all tipping. We hope that catches on with the mid-tier and lower-tier lines as well. There are other ways to incent the ship staff without tipping. Right now it is just a tool for cruise lines to nickel and dime customers and skim off of their employees' wages. For the second time this year, there was a norovirus outbreak on the Star Princess. According to Travel Mole 61 passengers on the ship's trip to Hawaii were impacted. The good news is that the vast majority of the ship's 2,590 passengers were not infected. Princess is taking all the steps to disinfect the ship and prevent further outbreaks. The last outbreak on the Star Princess occurred in May. Cruise Hive found this great drone footage of the Costa NeoRomantica. It gives you angles and views you typically don't see in cruise videos. Very unOfficial Travel Guides always has some interesting takes and reviews. The video above is no exception as a vegetarian heads to NCL Getaway's Brazialian Churrascaria. It is not just food though, as the video does work in some helpful suggestions, a few laughs and some looks at the Getaway. To learn more about the ship, check out the rest of the videos Very unOfficial Travel Guide made from the Getaway. The Carnival Pride will skip its scheduled stop at the company's private island Half Moon Cay in the Bahamas Thursday. The Carnival Valor will skip its scheduled Thursday stop in Grand Turk. The Norwegian Getaway will skip its Friday stop in Nassau. As the storm moves through the region, other ships may be impacted. Always remember to check in with your cruise line regarding schedule changes.